Maps and information for self-guided tours are available inside the entrance at the gatehouse. Much of the garden is accessible to people with disabilities. Several hardscaped pathways wind among flower beds and garden highlights, such as the Oklahoma Garden, Azalea Garden, and more. Work continues on adding new paved pathways every year. In addition, for those needing a little more assistance, free golf-cart transportation is available when reserved one week in advance. Call 918-786-2938 to arrange for the cart and services of a Lendonwood driver. The cart holds up to four people, including the driver. 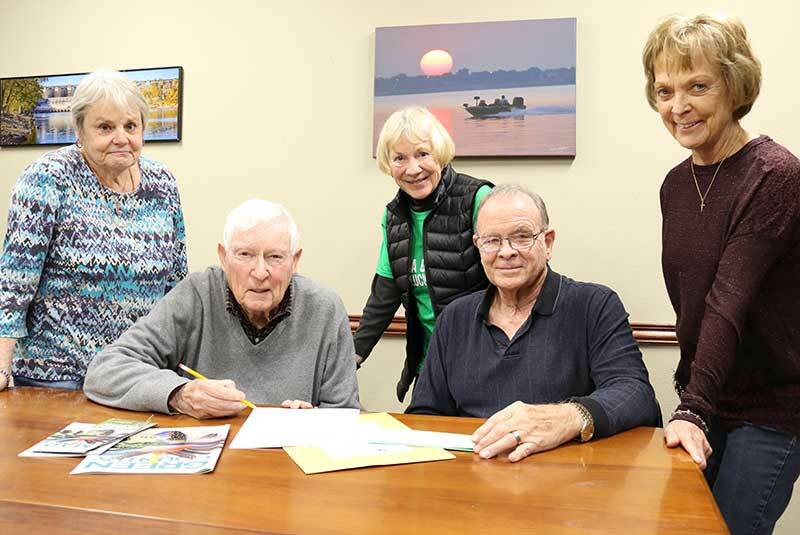 Lendonwood Board of Directors – Jim Corbridge, president; Jim Reynolds, vice president; Barbara Sparks, secretary; Margie Murphy, treasurer; and Judy Scarriot, assistant treasurer. Lendonwood Gardens is administered by an elected Board of Directors, whose mission is to ensure the continued success and development of the Gardens. The election of officers and Board members takes place each year at the Annual Meeting. The continued success of Lendonwood Gardens can be attributed in large part to the dedication and contributions of many community-minded individuals, including those who serve on the Board of Directors. Lendonwood extends a warm “thank you” to each of them. Other Members of the Board of Directors – Gary Daniels, Jim Corbridge, Melba Dagy, John Dunsworth, Ray Geis, Pauline Hale, Rick Miller, Jane Montgomery, Michele Norwood, Cindy Reynolds, Jim Reynolds, and Larry Toigo. Lendonwood Gardens was founded in 1995 by Dr. Leonard Miller, a retired dentist in Grove, who designed and built the botanical garden that now attracts numerous visitors each year. Dr. Miller’s interest in Japanese gardening and horticulture resulted in a unique blend of American and Asian gardening cultures at Lendonwood. The major plantings took about 18 months to complete, but significant numbers of plants are added each year as the Gardens evolve. The Gardens became a non-profit corporation, Lendonwood Gardens, Inc., in January 1997, when Dr. Miller donated the property for operation by the corporation. The corporation by-laws state that the purpose of the gardens is to: Provide a non-profit, educational, scientific association for the public to stimulate activity and bring together those persons interested in gardening and botanical research; Provide horticultural information to members and the general public; Assist the members and the general public in botanical gardening and research; Assist beginners in organizing their botanical gardening efforts. In December 2001, Lendonwood Gardens, Inc., purchased adjacent land and property from Dr. Miller to enhance the Gardens’ plantings and educational services. The adjacent five acres, which included Dr. Miller’s former home and surrounding gardens, allowed room for significantly expanded garden space and eventually may be used to help resolve some parking and visibility issues. Also, located in this area of the Gardens is the Angel of Hope statue, placed here to commemorate lost loved ones, especially children. An annual memorial service is held at the statue on December 6. We invite you to become a member of Lendonwood Gardens and help maintain this botanical treasure in Grove. The purposes of the gardens are to preserve and display unusual and rare plants and to provide horticulture research so that these plants may be used on a routine basis in home landscaping. You can help us reach these goals by becoming a member of Lendonwood Gardens. Memberships help us pay for materials such as flowers, seeds and fertilizer and for labor and maintenance in the garden. Lendonwood Gardens depends on your support for its preservation and maintenance. Thank you for your contribution to the future of Lendonwood. Garden Party for 25; unlimited visits to the garden for member, family, and guests. Personal guided tour of garden for up to 20; unlimited visits for members, family, and guests. Unlimited visits to the garden for member, family, and guests. Unlimited visits to the garden for member and family. Unlimited visits to the garden for member. ***Members also are entitled to a discount on garden rental and events. Lendonwood Gardens depends heavily on the contribution of time and effort by a cadre of volunteer gardeners to help maintain the beauty and growth of plantings in the six-acre public botanical garden. Volunteer gardeners help plant, fertilize, mulch, prune and weed to help Lendonwood retain its appeal as one of the finest small botanical gardens in the four-state area. Coordinated by Melba Dagy of Grove, a Master Gardener, the group is trained in good gardening techniques as they volunteer their time. Each Wednesday has been designated “Gardening Days” at Lendonwood, with volunteers contributing as much time as they wish. Some volunteers may garden an hour or two, and others may spend three to four hours. Any level of assistance in maintaining Lendonwood’s beauty is greatly appreciated. Timing of group gardening efforts will vary with the weather. The group usually meets at 9 a.m. during April, May, September and October. During the hotter months of June, July and August, the group starts gardening at 8 a.m.
A few volunteers elect to work independently after completing an orientation. Some volunteers prefer to help with bigger projects and can be contacted when some special effort is needed. We invite you to become part of the Lendonwood Gardeners today. Please let us know of your interest by completing our on-line Lendonwood Volunteer Opportunities form. The future of Lendonwood Gardens depends on the support of donors who value the role of a unique botanical garden as a resource for the community and education. A non-profit corporation, Lendonwood is maintained through private gifts and volunteer labor. In the next few years, private support will play an even more significant role as the Gardens expands in size and plantings. Lendonwood Gardens includes four acres outside the wooden fence — space that is being developed as funds become available. Eventually, the property, which includes the former home of Lendonwood founder Leonard Miller, will provide needed space for expanding educational programs for children and adults, as well as a place for community events of all types. The space also allows us to address some parking and visibility issues, while providing room for expanded garden space. We invite you to consider investing in the future of Lendonwood Gardens, truly a “growth” opportunity. For more information, please contact Lendonwood at 918-786-2938. Pay with your Paypal account or credit card. Please email the names of all your guests, including yourself, to info@lendonwood.com. If you can’t attend but would like to donate, please do so with the Donate button below. 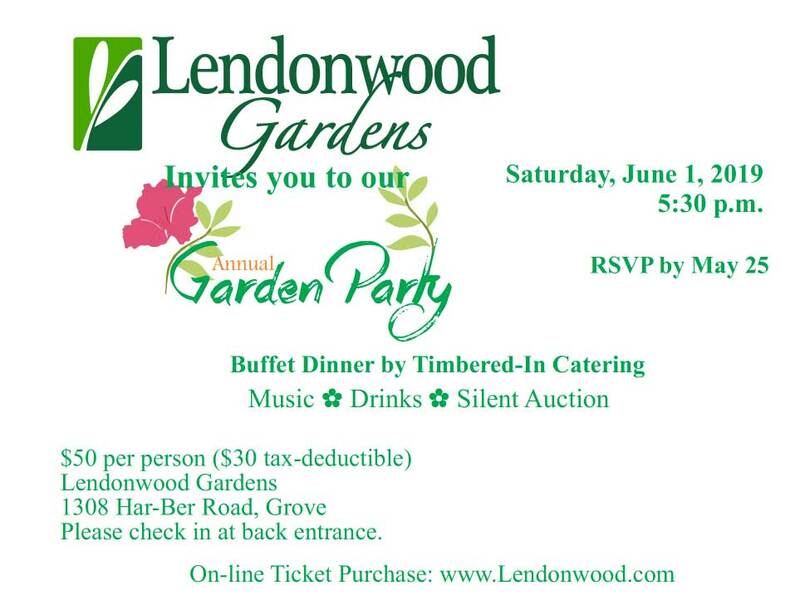 Lendonwood Gardens, Inc. is a non-profit corporation dependent on fund raising activities, charitable giving, and donations. Your donation will provide vital support to the Gardens. GOOD NEWS! Lendonwood now participates in the American Horticultural Society’s Reciprocal Admissions Program (RAP). That means members of Lendonwood will receive free admission and/or additional benefits at over 320 gardens throughout North America! Become a Lendonwood member now and enjoy this new benefit. For more info about RAP, check out www.ahsgardening.org/rap. Complete the Membership form to select your desired membership level. After form submission you may pay for your membership using either your PayPal account or credit card of choice. Form fields denoted by red asterisk are required.